Pittsburgh transfer and sophomore guard Marcus Carr won't play for the Gophers this season after the NCAA denied his waiver request for the second time, sources told the Star Tribune on Wednesday. The U appealed the NCAA’s decision last week to deny Carr's initial waiver request to play this year. Major college transfers have to sit out one season unless their request is approved, per NCAA rules. Carr’s presence in the backcourt would've helped Amir Coffey and Isaiah Washington handle point guard duties this season after the loss of graduated senior Nate Mason.Carr, a Toronto native, averaged 10 points and a team-high four assists and started 27 games for Pittsburgh in 2017-18, but he transferred after Panthers coach Kevin Stallings was fired for a $10 million buyout in the spring. 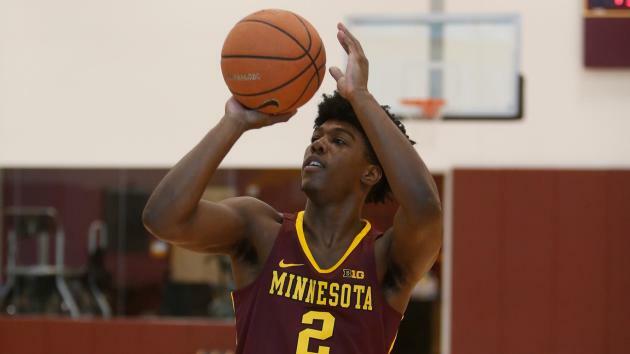 "An absurd, unjustifiable ruling by the NCAA on Minnesota’s Marcus Carr," ESPN college hoops analyst Jay Bilas tweeted Wednesday. " 'Student-Athlete welfare' is a meaningless term. Forcing Carr to sit out benefits no one, just hurts an unpaid student. What a joke." The Gophers opened the season 2-0 with wins against Nebraska Omaha and Utah. They play Sunday against Texas A&M in the Vancouver Showcase, which is in Carr's native Canada. Carr tweeted a statement about the process a week ago when his waiver was first denied by the NCAA. The initial rejection was a surprise to the Gophers program, because other players around the country had received waiver approval to play this season. Minnesota coach Richard Pitino seemed confident even before Monday's win against Utah that Carr would not have to sit out this year. I’m amazed by the waiver decisions that r made by the @NCAA / zero logic occurs / one player has a story & it is accepted but yet a kid like MARCUS CARR with legit reason @GoldenGophers is denied / goes to Pitt to play for Kevin Stallings & he gets fired ! NCAA denies appeal. Some Minnesotans have seen their waivers granted by the NCAA this season. Siena transfer Jordan Horn, a St. Paul native, was eligible to play this season for North Dakota State after playing in 30 games last season with his old program, including 13 starts. Pepperdine transfer Trae Berhow, a Mayer, Minn. native, left after his coach was fired at the end of last season, but he was ruled eligible to play right away by the NCAA at Northern Iowa this fall. Berhow's hardship waiver included a family situation with his grandfather falling ill.
Big Ten fans might remember the name Mark Smith at Illinois. The former four-star recruit and Illini freshman guard had his waiver granted last month to play this year at Missouri. Higher profile waivers granted this offseason were former Auburn standout Mustapha Heron at St. John’s and former Alabama forward Braxton Key getting to help Virginia compete for another ACC title this season. Once the season started there were several waivers denied right away, including Carr's last week. But the NCAA granted Texas transfer James Banks' waiver to make his debut for Georgia Tech on Tuesday night in a loss against Tennessee. Banks saw his playing time decrease last season, so he looked for another program to get more opportunity. How that situation and other waivers were deemed more suited to be granted than Carr's case is a head scratcher for many Gophers fans on social media. The Star Tribune contacted the NCAA for comment more than a week ago about the lack of consistency in waivers this year, but no response had been received as of Wednesday night. Carr joins junior guard Payton Willis, a transfer from Vanderbilt, as potential difference-­makers sitting on Pitino’s bench this season.